I showed my favorite reds yesterday and it's time for me to make that tough decision... Today I will show you the one polish that makes my heart race every time I look at the bottle and have it on my nails. It's simply stunning and takes my breath away! 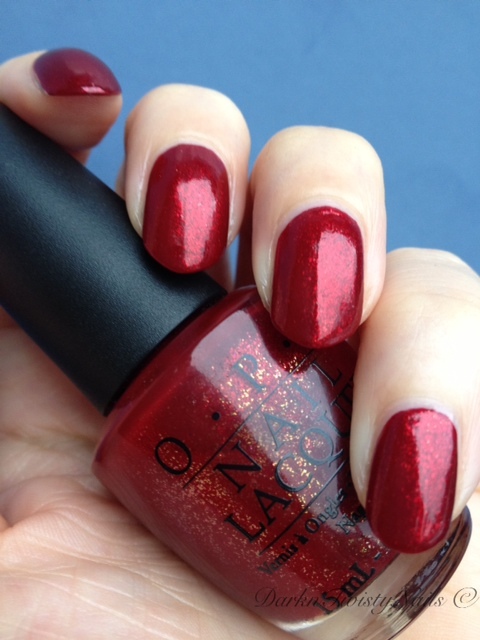 Yes, I feel that strongly about this polish! It took me forever to find it and now that I finally own it, I'm only wearing it on special occasions, as I'm afraid I'll run out. 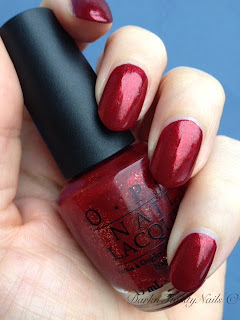 Did you guess that OPI Smitten with Mittens is my all time favorite red nail polish? Well, you are right! 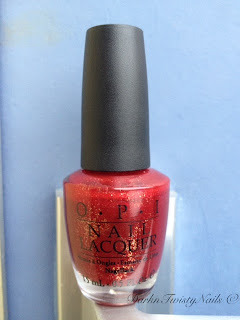 Not only is this deep, rich red with golden micro glitter my favorite, but it's also my husbands favorite! Every once in a while he will ask me to wear "that polish you know I like so much" and I'll pull out Smitten. 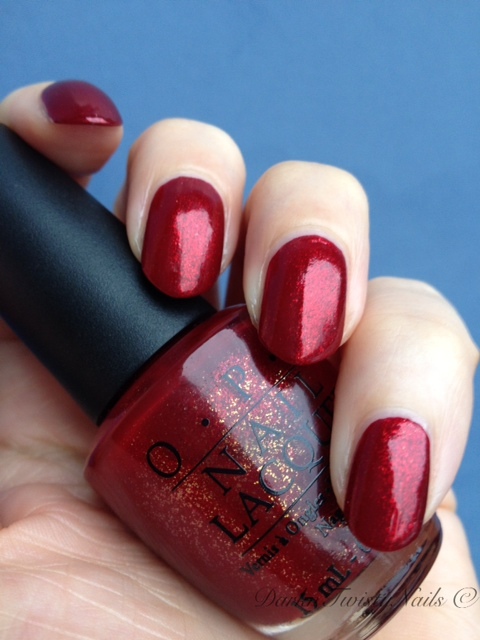 The fomula is perfect, it flows on the nail with ease and is opaque in just 2 thin coats and dries really fast. Smitten is part of the 2009 OPI Holiday wishes collection and unfortunately it's hard to find these days. (Merry Midnight was also part of this collection and I really want that one too, but it's even harder to find...). Just look at this beauty, no wonder it's my favorite! In the bottle the golden glitter is a little more noticeable than on the nail, but when the sunlight hits this polish, the golden sparkle comes out to play. Unfortunately, it's grey outside and raining, so I wasn't able to capture the full beauty of this polish, but even without a nice ray of sunlight, this polish is stunning! What's your favorite color polish to wear? What a fantastic red...OPI needs to bring it back!! Now that is a beautiful red! Wow...thay red is so gorgeous! It looks fantastic on you!